Coffeeyay launches his video pack, expanding on his previous Math in HUSNG video series with almost 5 hours of brand new content. As a bonus we've also added all the previous videos, 3 hours and 52 minutes of additional content, to bring you a video pack totaling 8 hours and 46 minutes in length. These are Coffeeyay's Hyper Turbo Results through Dec 2012. Below is a description of each video in the series. We have made the introduction video free, as well as a clip from video 11 that discusses Nash ranges versus ranges Coffeeyay has calculated to best exploit the average opponent, as well as the average loose and tight opponent. The introductory video has Coffeeyay taking you step-by-step through his video pack. He breaks down the different modules and gives you a glimpse of what you can expect to learn in each of them. Coffeeyay introduces key poker math and calculations that are useful to heads up players of all levels. He uses examples relevant to every day situations including hyper turbos and facing 3bet shoves after minraising. Coffeeyay also explains important variables like effective stacks, pot size and equity. He also offers suggestions for private study at the end of this 45 minute lesson. Coffeeyay continues going over the essential math in HUSNGs, breaking concepts down into easy to understand and effective ways. He focuses on fold equity, and again offers further study suggestions at the end of the video. This video focuses on combining pot equity and shove equity in situations preflop and post flop. Coffeeyay lays out easy to understand tips and equations on a powerpoint presentation throughout the video. He also recommends various software at the end of the video, further study suggestions and touches on concepts covered more in depth later on in the pack. 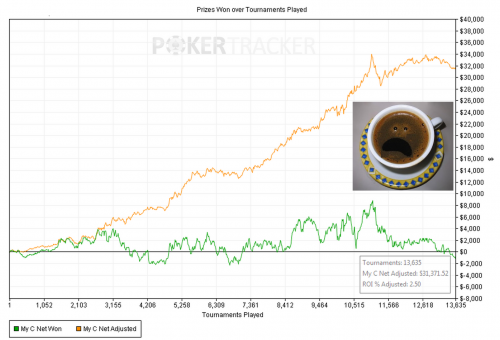 Coffeeyay uses the powerful ICMIZER tool to perform calculations on open shoving and 3bet shoving situations. The first new video of the pack, Advanced Computation, takes math to the next level. Coffeyay takes you more in depth than he has before, focusing specifically on topics such as bluffs and semi bluffs on multiple streets. This video focuses on game theory - discussing different types of strategies, Nash equilibria, and how to try to use it in game to improve your thought process. Coffeeyay starts to talk about Population Tendencies in this video. He focuses on how to use population tendencies against a random opponent. After watching this video you should feel more confident with the ranges you should be using against your opponent, despite having no history against them. Bayesian Statistics wraps up Coffee's section on Population Tendencies. Coffeeyay walks players through noticing villain frequencies and how those move villain away from the population. The video also focuses on taking the ranges you are using from the population and adapting them as your sample size with your villain slowly gets larger. After focusing on Population Tendencies in the last section, Coffeeyay immediately ties that into the final section of the video package, Solving Push-Fold HU Poker. The first part of this section is based on Readless Ranges and will use the tools previously discussed in the video pack. Coffeeyay shows you how to find the maximally exploitive ranges you should be using at different depths and how they compare to Nash. Coffeeyay quickly finds an opportunity to utilize the recently discussed Bayesian Statistics in the closing video of the final section, Solving Push-Fold Poker. As your villain deviates from the population tendencies, this video will show you how to adapt your ranges to further exploit them. * Denotes video was previously released in the standard membership and has been added to this pack as a bonus.